Every year, I anticipate the arrival of the lilacs in a way that is hard to explain. The smell of lilacs instantly transports me back to being 6 years old when I first smelled lilacs. My Grammy helped me gather bunches of the pungent blossoms at dusk on a May evening. Freshly cut from my Grammy's hedge at the front of her garden, the lilacs filled a handbasket which was securely hidden in the damp of the water faucet "closet" on the side of the house to be given the next day as a surprise birthday gift for my mom. Like many aroma-based memory triggers, for me the smell of lilacs evokes the happy feelings of peace, tranquility, and steadiness that accompanies the simple yet tender experience of being a six year old and learning the valuable lessons of giving and gardening from my Grammy. With all of that connected to the lilacs, you can only imagine the anticipation I have as I wait for the lilacs in our own garden to bloom. I watch each bud from the time of their formation some time in December after the last leaves from the previous summer have fallen off. I walk past them everyday on my way to the back garden, from December through January and February, checking their progress as I pass. When I finally see the first lilac buds bursting open some time in March, I know that spring has truly arrived at Rosehaven Cottage! And then I try to go out and stick my nose in them at least once a day until the last blooms have wilted and faded. Lilacs grow on a flowering shrub-like bush that typically likes colder climates than our Mediterrenean San Francisco Bay Area climate. 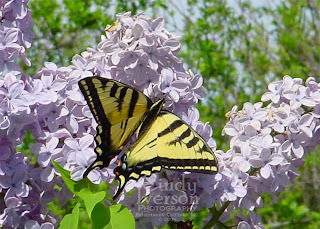 Lilacs are the state flower of New Hampshire and love the New England climate with the cold winters. Lilacs need to be stressed by the winter cold in order to set buds and produce blossoms prolificly. 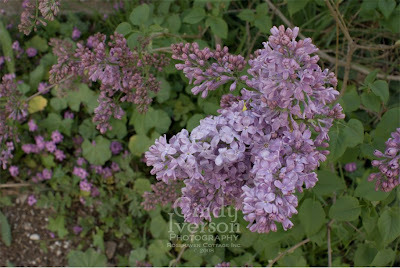 And since lilacs only have one big show a year, the lilac-loving gardener (like me) wants as many blossoms as possible. I have a sad little bush in the front garden that aspires to greatness but never quite makes it. It's quite diminutive for having been in the garden 7 years. Why? Because it's a cold climate lilac--a President Grevy I believe (don't quote me on that). For years, gardeners like me have tried to trick the cold climate lilacs into being stressed by cutting off their water supply around August. Sometimes it works. Sometimes you just end up with a crispy lilac bush. 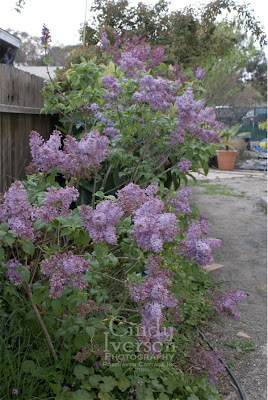 Since the lilac is my favorite flower of all time, it was very disheartening trying to grow lilacs in this way until I discovered the warmer climate varieties of lilacs that have been bred to do well in California (they also do well in the south and southwestern areas of the U.S.). The warm climate varieties don't require a cold winter to be great bloomers. Hallelujah! About 6 years ago, I put in an entire row of them going all the way down the fenceline on the southwest side of the garden--probably about 9 in total (maybe more--I've lost count). I planted Syringa vulgaris Blue Skies bushes alternated with Syringa vulgaris Lavender Lady bushes. From their first spring here at Rosehaven Cottage, they have never failed to produce the cool blue-purple blossoms I love with their accompanying heady fragrance. And each year there are more and more blossoms as the bushes rise in height. I am so glad I found the warm climate lilacs. I don't know what our garden would be without their gorgeous and fragrant display. As a postscript to this post, I wanted to thank Lynda Lehmann for the sweet friendship award she gave me. Lynda is a highly talented artist that sees the world in a beautiful way and then recreates colorfully on canvas--both tangible and digital. If you haven't visited her blog, you really should head over there and take a while to visit her online galleries. Thank you, Lynda! What a beautiful post..I love the story. Your lilacs are breathtaking! Cindy, lilacs bloom later here, of course, but they still mean something special. My grandma told me that people used to plant lilacs by their front and back doors so the fragrance would waft into the house and also greet any visitors. Where I live, you see more large, overgrown lilac bushes, loaded down with blooms that have been around for decades, than you see newer ones. I love that. It is a remnant of an earlier time, and modern day piece of the history of that home. I love your lilacs. They are such a lovely way to greet spring. Lilacs don't show up here until summer. I'm quite jealous of you!! I absolutely adore lilacs also..they are my all time favorite! I love your photos! Cindy, your love for these comes across. I hope you get the biggest blooms ever! I had no idea they are the N.H. state flower, as I rarely see them when we're there. We have them here on Long Island, and I would enjoy their pungent scent if it weren't for those pesky bees that hover over them! Lilacs seem to hold lovely memories for many people and it was great to read your story. I used to have a white lilac in the garden of the first house I lived in after I got married. And congrats on that cute award! I perfectly understand how you feel about lilacs. Mind you, I'm still at least two months from enjoying them here, but i'll enjoy yours vicariously...such soothing colours and fragrances. Wow, so beautiful! I can almost smell the sweet aroma of those Lilacs. Great photos, I love your blog!